"The beast raged; it punctured the air with its spite. But the girl was fiercer. Great power comes at a price, forcing Tea to leave her homeland to train under the guidance of an older, wiser bone witch. There, Tea puts all of her energy into becoming an asha, learning to control her elemental magic and those beasts who will submit by no other force. And Tea must be strong—stronger than she even believes possible. Because war is brewing in the eight kingdoms, war that will threaten the sovereignty of her homeland…and threaten the very survival of those she loves." I've been dying for some good fantasy lately and boy did I find some. 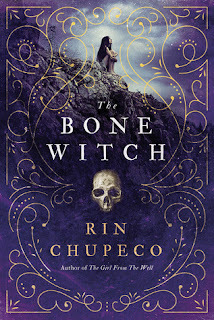 The Bone Witch was such a great interesting read and Chupeco did such a great job with her story. The back and forth from present to past was awesome and really made you keep reading to find out what the hell happened and what was going on. The main character Tea, was such a great character. She had a depth and attitude to her that delighted me to now end. The descriptions of the magic and the world Chupeco created was great and one way she draws you into the story. I really love her descriptions of the Hua's and the heart pendants and what it means. There was a couple of things I had a problem with, one was the names and locations in the story. I was so confused on keeping track and who was from where that I had to constantly keep backtracking to read over some things. This made the book longer to read than I liked. The ending had me so interested to see what the hell happened and what made Tea become how she is. I really can't wait to read the second story to figure things out. I can only hope it gets better and clears up some of my questions.